This was such a fun class project! Over the course of a couple of months, we cut out the figures, colored them, and then folded/taped them so they could stand. Aren’t these little figures cute?! I store all the orchestra members in a shoebox. Every week when we got out the materials to work on this project, we started by sorting all the figures onto the stage in their appropriate sections. Even though we have finished the project, I still pull it out every now and then as a quick review to begin our class. I am taking my homeschool music class on a field trip to see a children’s concert put on by the Toledo Symphony in a few weeks. They are so tickled that they will get to see and hear these instruments live! You can download the stage pieces on the Printables > Other Resources page by scrolling down to the O’s for “Orchestra Stage Pieces.” The orchestra figures are downloadable from the St. Louis Symphony’s website (click here for the”Stand Up Symphony” musician paper doll coloring activity link). This would make a great studio project to work on during monthly group classes as you learn about the instruments. 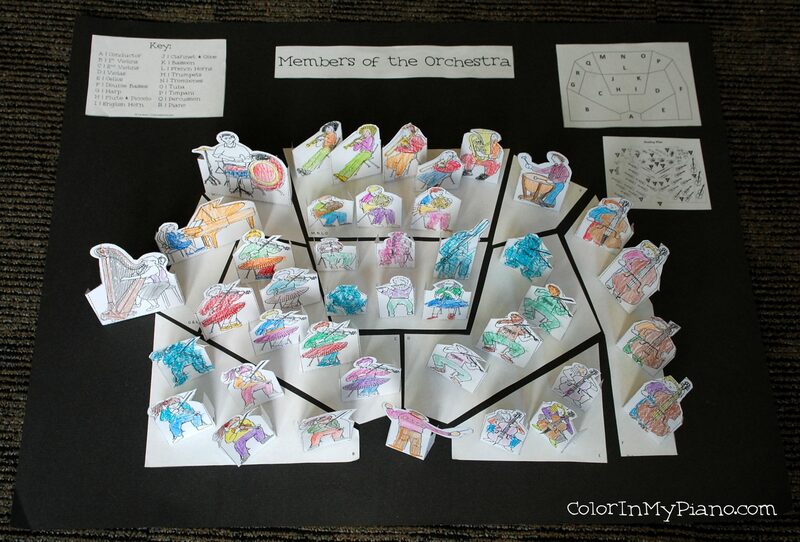 Or, if you have a waiting room area, perhaps you could have students work on creating an orchestra together that way! Also: Just wanted to remind you all to enter the NoteWorks app giveaway if you haven’t already — today is the last day to enter! The more I use the app, the more I am impressed with it. Stay tuned to hear the winner announced tomorrow! What a great way to teach instruments and sections of the orchestra, and your stage addition is so clever! Love it! Thanks for sharing this, Joy! I’m excited to try it with my students next time we study anything orchestra-related. Great resource! Thank you so much! Hey – you don’t happen to have a PDF of the stand up figures for the orchestra ? I can’t find it in the link. any more… they must have removed it or moved it? So cool wish I could find the little figures! hi emma the link has been removed. do you have a copy in your laptop? can send to my email? trinawong86@gmail.com. i need the figurines desperately for my group class. Absolutely thrilled with the ‘stage’ orchestra and figures. I am not a music teacher but this is a perfect introduction for a regular classroom project. Any chance their is somewhere else to get the stand up figures? The link to the St. Louis Symphony no longer exists :( This looks like a wonderful project, especially for my younger students! I just sent you an email, Emily. Can you please send me the link with the stand up figures? Love that idea! 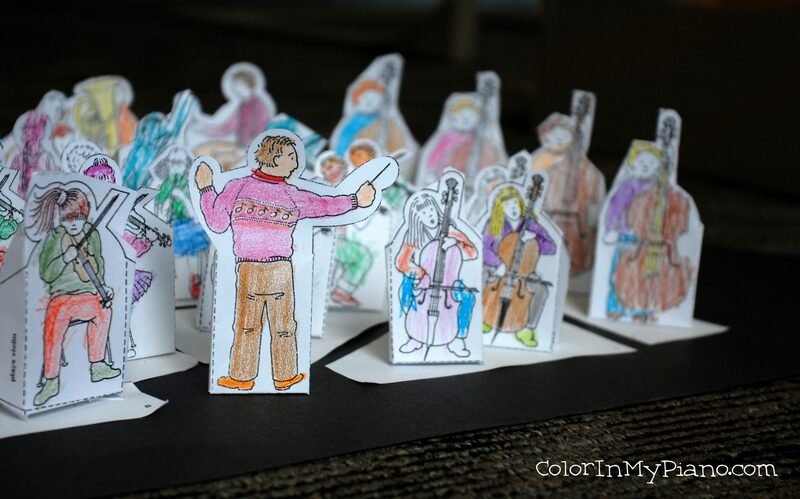 I would love to try out those “stand up figures” for the orchestra with my class. They look absolutely brilliant. I looked all over the net and didn’t come across them. Any chance you might still have them? Could you please send me this link. I have searched endlessly with no luck. Thanks in advance. If you could kindly share the stand up orchestra figures it would be great. The link is definitely not working to the the Saint Louis Symphony’s download, and I even wrote to them and did not receive a reply. I would love to be able to have my students make the orchestral setting like the one you showed. Is there a way that you could put the figures into a download from your site if you still have them? Any chance you could send me the figurines too? Thanks! Me too, please? I’d love to use them too! Thank you! Love this idea! Please could you mail me link for colouring figures as page has been removed. As I also find this a wonderful and fun way to study the instruments, would it be possible for you to send me the figurines as well? I was also looking for the figures online and came to a dead end. Please, add me to the list of those receiving the email version! Thank you so much. I’m so looking forward to sharing this project with my grade 3 music students. Hello. Would you please send me the orchestra figures. They look wonderful, but the link does not work. Thanks. Can you please send me the file for the orchestra peices? I am a going to start a lesson on parts of the Orchestra with my Gifted and Tallented students and would love to have these to let them visually see how to assemble an orchestra. Me too. I love the stand up orchestra. Could you please send me the link as well. Is it possible to get the stand up figures emailed to me. Thank you! I want to do this project with my 7th graders and printed out the orchestra chart, but cannot find the stand up characters/instruments…I have tried everything! Help please! Joy, you have so many useful worksheets! I make 3d paper nativities, and we are getting ready to study orchestra. These stand up orchestra pieces and the stage you created are awesome! Could you send me the pdf as well? I am going to share them with the 25 other home school families in my CC community as well. Me gustaria tener el pdf con los imprimibles de los instrumentos de la orquesta. Could you you please send me the stand up symphony figurines?? Well, I’m not sure if you’re still checking these comments, but a friend shared your blog with me as we are studying the orchestra with our Classical Conversations community and I would LOVE a copy of the stand up figures. Are you still emailing them out? Not sure if you received the link but the comment directly above yours has the link and I just printed them out. Works great! nevermind. I see the link posted a few comments back. Works perfectly!